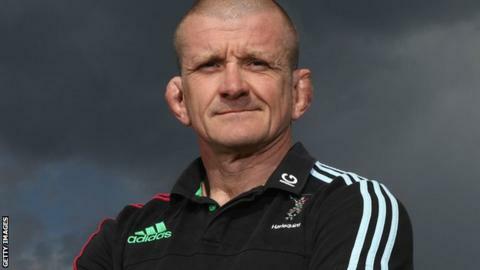 Graham Rowntree said he had been "craving" a return to coaching, after being named as the new forwards coach at Harlequins. Rowntree spent eight years as an assistant coach with England, but lost his job in December after the hosts' early exit from the Rugby World Cup. The former England prop will move to the Stoop in the summer, working under new director of rugby John Kingston. Rowntree, 45, told BBC 5 live he was "excited" by his new job. "This opportunity has come sooner than anticipated given what happened at the World Cup, but it's here and I'm determined to grasp it," he said. "It's the start of a new adventure." After being appointed as Stuart Lancaster's successor, England head coach Eddie Jones dispensed with the services of Rowntree and fellow assistant coaches Andy Farrell and Mike Catt. "It wasn't the easiest period of my life, but you've got to learn from these things," Rowntree said. "It was hard work, to be honest. You've got to move on and look forward. So here I am, able to look forward, working at a great club. "There are a lot of things [you learn], but as long as you use that going forward, then it's of some benefit in the future." Steve Borthwick was recruited by Jones as forwards coach, but Rowntree says he has no complaints about the decision to start afresh. On the England coaching staff between 2008 and 2015, he is now eager to take on the challenge of working at a Premiership club. "I was ready for a club role," he said. "That involvement I've been craving. "There's so much potential - look at the blend of the squad - so that makes it very appealing for me. I love coaching, and I'm ready to do it for a long time." Quins forward Nick Easter will also join the coaching staff next season, overseeing the defence. Easter says Rowntree's reputation remains intact despite the World Cup disappointment and insisted he did not have to "prove anything". Easter added: "What happened at that World Cup was a collective and it came down to 10 minutes against Wales. It's fantastic for him personally that he's back doing what he does best." Rowntree's appointment means all three of Lancaster's assistants are now back in work, with Farrell part of the Ireland coaching set-up and Mike Catt joining outgoing Harlequins director of rugby Conor O'Shea on the Italy staff. "He's had various offers," he said. "He's just waiting to pick the right one."